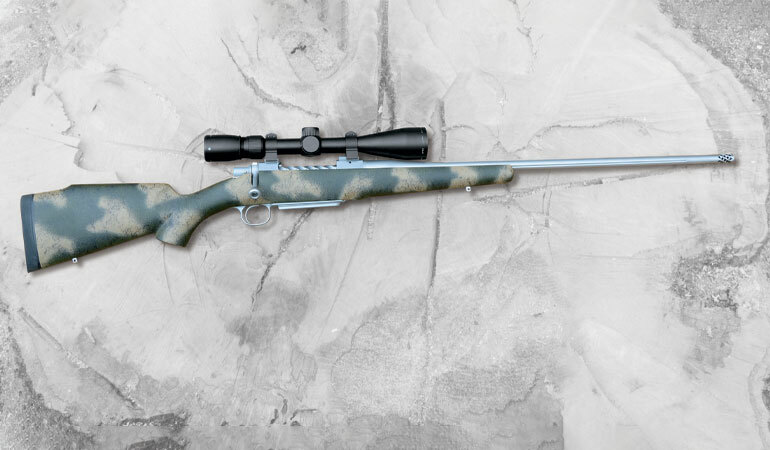 Cooper’s Model 92 Backcountry is a smooth-cycling, accurate rifle made for the mountains. Model numbers are given to rifles by manufacturers for various reasons. Back in 1968, Bill Ruger chose Model 77 for his new bolt-action rifle because the Winchester Model 70 and Remington Model 700, both featuring the numeral 7, had already proven to be extremely successful. Cooper Firearms of Montana, on the other hand, may be first to use the weight of a rifle as its model number. 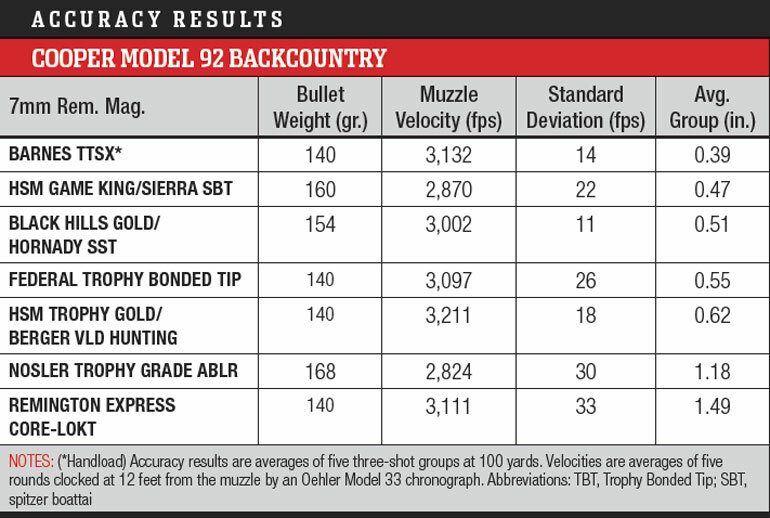 When the new Backcountry rifle ended up at a mere 92 ounces, the company decided to call it the Model 92. The claimed weights of some rifles are to be taken with a grain or two of salt, but at 93.7 ounces on my digital scale, this one is quite close. That’s for a 7mm Rem. Mag. Due to bigger holes through their barrels, a Backcountry in .300 Win. Mag. should be just about dead on 92 ounces while the .338 Win. Mag. would likely beat that by another ounce or two. With a few exceptions, the Model 92 action is a dramatically lightened version of the Model 52 action, which was introduced in 2007. How did Cooper manage to shed so much weight? Well, for starters almost a quarter of a pound was whittled away from the bolt alone. 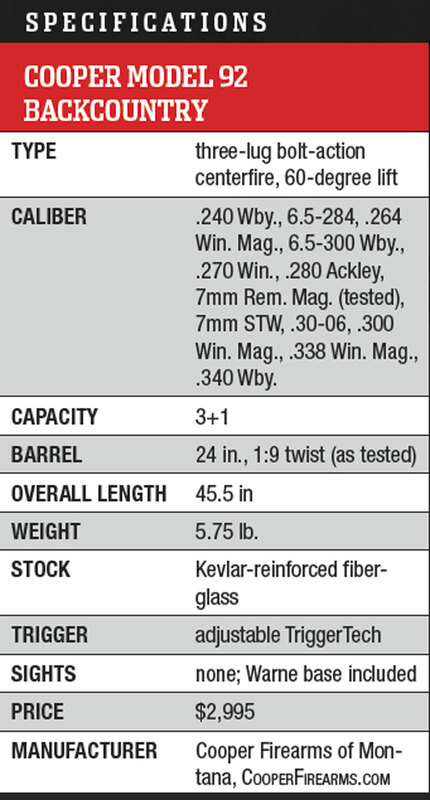 The bolt of my Model 52 in .25-06 weighs 14.2 ounces; the Backcountry’s bolt is 10.3 ounces. The bolt handle shank is noticeably thinner, and in addition to being smaller in diameter, the knob is hollow. Extremely deep spiraled fluting of the bolt body left another ounce or two on the shop floor. Weight was reduced even more by using an aluminum bolt shroud of considerably smaller diameter than the steel shroud of the Model 52. Both bolts have Cooper’s signature three-lug locking system, and while their spring-tensioned, rotating extractors are the same, the ejectors differ. The Model 52 has a pivoting-blade ejector located in the floor of the receiver bridge, while the Model 92 has a spring-loaded plunger at the front of its bolt. I prefer the former due to its controlled ejection of spent cases and loaded rounds, but the two designs are equal in reliability. The counterbore wall at the face of the Model 92 bolt is interrupted only for extractor clearance, but the wall of the Model 52 bolt has an additional slot for passage of the ejector. Engagement of a groove in the right-side locking lug with a track milled into the receiver rail serves to reduce binding as the bolt glides to and fro. Cooper rifles are known for smooth bolt travel, and while my Model 52 does not have the grooved locking lug, I was unable to detect any difference in bolt wobble between it and the Model 92. A cocked firing is indicated by protrusion of the tail of the cocking piece beneath the bolt shroud. Bolt travel is 4.75 inches. Pressing the serrated tab of a small lever located on the side of the receiver pivots its opposite end out of the path of the left-side locking lug, allowing the bolt to be withdrawn from the receiver. 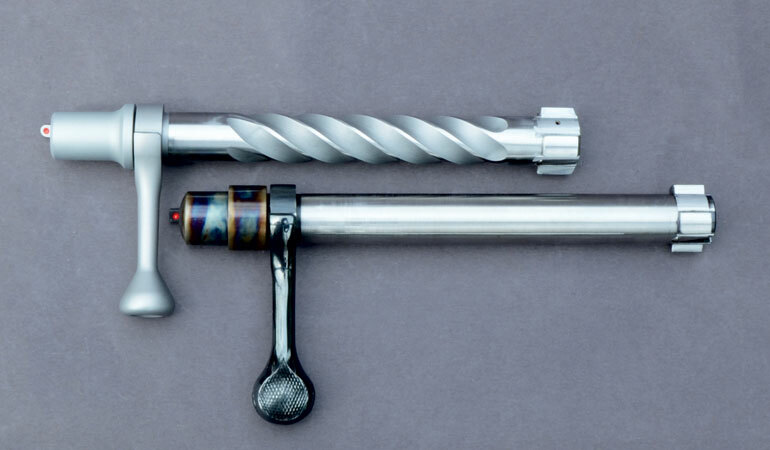 The Model 92 bolt (top) is significantly lighter than the Model 52 bolt, thanks to aggressive fluting, a slimmer handle, a hollow knob and an aluminum bolt shroud. The bolt and receiver of the Model 92 featured in this report were stainless steel, but 4130 chromoly is an option. The standard Model 52 receiver length of 813/16 inches was retained, but deep facets machined into both sides of the receiver bridge and ring along with a reduction in diameter at the midsection of the receiver probably shed as much if not more weight than all the other modifications combined. Weight was further reduced by replacing steel bottom metal (5.4 ounces) with 7075 aluminum (1.9 ounces). Cooper’s synthetic stocks had been outsourced, but they now are hand-laid in-house. They are composed of Kevlar-reinforced fiberglass with aluminum bedding pillars at the tang and receiver ring. The stock of the test rifle pushed my scale to a feathery 25.1 ounces, and that included a 0.75-inch Pachmayr Decelerator recoil pad and a pair of stainless steel posts awaiting quick-detach sling swivels. The stock was finished in a mottled tan/green, but other camo patterns and colors as well as solid colors are available. Other manufacturers who have yet to figure out how a synthetic stock should be shaped and dimensioned would be wise to closely examine this one. The 24-inch stainless steel barrel begins with a diameter of 1.165 inches at the receiver and then tapers sharply to 0.592 inch at the muzzle, where it terminates with Cooper’s own 30-port muzzle brake. The brake increases barrel length to 25.5 inches, and the joint between it and the barrel is precise enough to avoid detection by all except the sharpest eyes. The brake was effective enough to make me glad it was there while squeezing off rounds over sandbags and loud enough to make me want to replace it with a thread protector when hunting with the rifle. Specifications received from Cooper indicate a Jewell trigger, but the rifle sent to me had the Primary model trigger from TriggerTech. Due to a reputation for reliable performance under harsh conditions, triggers from this company have become quite popular among Precision Rifle Series competitors, with seven of the top 10 finishers in the 2017 final match using them. 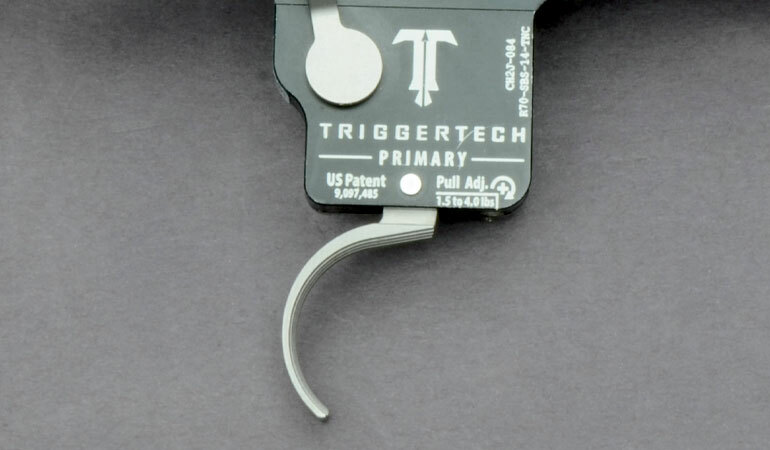 Described by the company as “frictionless release technology with a free-floating roller captured between the sear and the trigger,” it is said to reduce the friction that occurs between the usual flat sliding surfaces in other triggers. While it was extremely smooth, I could feel no difference between it and top-quality triggers of more conventional design such as the Jewell and the Shilen. Pull weight adjustment range is 1.5 to 4.0 pounds, and from the factory it broke crisply at 28 ounces with a variation of less than two ounces and no detectable creep or overtravel. The bolt can be rotated with the two-position safety in its engaged position. The Mauser-style internal magazines of various bolt-action rifles sized for long cartridges are often reduced in length internally to accommodate shorter cartridges by the insertion of a filler at the rear of the magazine. Cooper takes a different approach with its detachable, single-column magazine by matching lengths with different families of cartridges. Further weight reduction comes from the aluminum bottom metal. Cartridges from the single-column magazine feed with silky smoothness. The Model 52 is the company’s longest action, and rifles built around it are available for cartridges ranging in length from the 7x57 Mauser to .375 H&H Mag. While bottom metal length for those two cartridges is the same, magazine external lengths are 3.5 inches for the former and 3.81 inches for the latter. 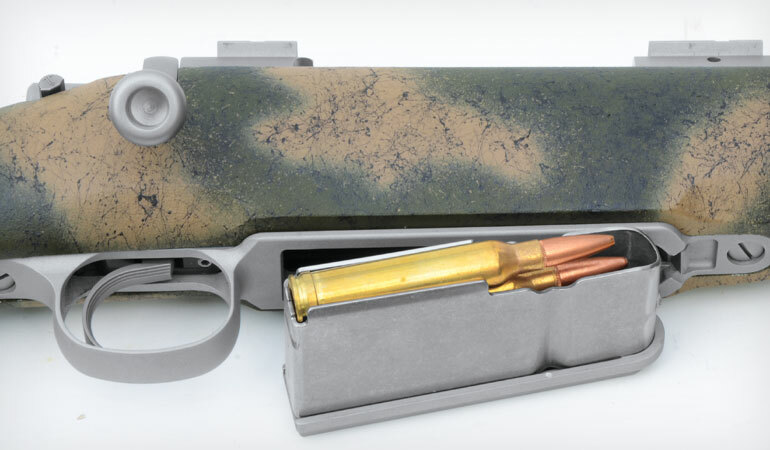 The magazine is formed from thick-wall stainless steel, and regardless of the cartridge, capacity is three rounds. The magazine for standard cartridges is flush-fitting, and while the belted magnum version extends a bit below the belly of the rifle, it is not enough to interfere with a comfortable carry. The Vortex Razor HD LH scope used for accuracy testing weighed 16.6 ounces. A Warne two-piece base came with the rifle, and it along with Warne medium-height rings added another 4.7 ounces. I had other magnification ranges to choose from, and while I would prefer the 1.5-8x32 or the 2-10x40 for hunting, I opted for 3-15x42 because its higher magnification would be helpful in verifying Cooper’s half-m.o.a. accuracy guarantee. 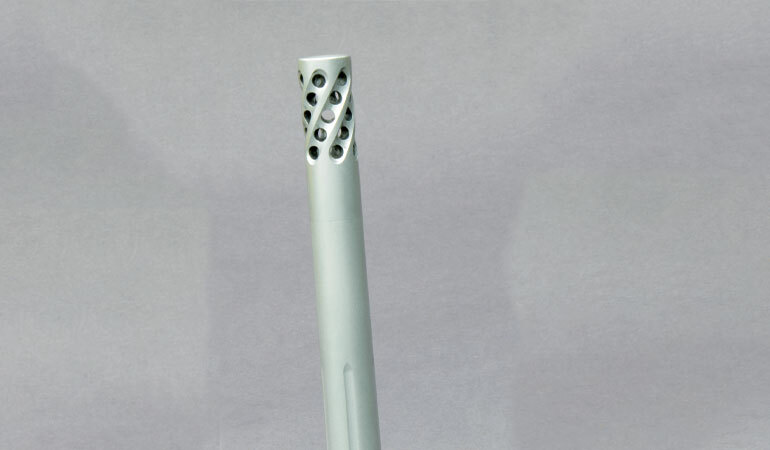 The Backcountry’s effective muzzle brake has 30 ports and is spiral fluted. The seam between it and the barrel is almost invisible. Like so many scopes made today, its tube is rather short at 55/8 inches. That’s plenty for a short action, but when mounted on the long action of the Cooper rifle, there was zero room for shifting the scope in either direction. Eye relief was okay during my accuracy test because I was wearing a light shirt, but in order to position the scope farther to the rear to compensate for wearing heavy clothing on a cold-weather hunt, I would have to use extension rings, and I do not like them at all. A Picatinny rail is another solution, but I’d rather not have a one-piece base on a big game rifle because it can interfere with quickly single-loading a cartridge over an empty magazine when that ticked-off grizzly is 50 yards away and closing fast. A bit more tube length in the Vortex scope would be an improvement, as would click-adjustable windage and elevation turrets rather than free-turning. On a more positive note, those adjustments were precise, the side-mounted parallax adjustment closely agreed with the distance markings on the knob, finish and attention to detail were top drawer, and you’d be hard-pressed to find better optical quality at the price. Considering its magnification range and a weight of only 16.6 ounces, a lot of performance was packed into a relatively small and light package. My eyes are a bit older than they used to be, so I have to dial back the eyepiece of any scope quite a bit for a crisp reticle focus, and the Vortex had more than enough range for that. All Cooper rifles up to .338 caliber depart the factory with a half-minute accuracy guarantee, and a test target is included. Winters are long, snow is deep, and winds blow hard in Montana, so all rifles are shot over sandbags on an indoor range at 50 yards—the longest distance Cooper’s basement facility can handle—to verify accuracy. A three-shot group included with the Backcountry measured 0.163 inch, and since group size is an angular measurement, that converts to 0.326 inch at 100 yards. The only information included on the handload used to shoot the group was IMR 4831 powder and the Barnes 140-grain TTSX. Through the years I have shot a dozen or so Cooper rifles in various calibers, and four in .22 Long Rifle, .17 Rem., .25-06 and 6.5-.284 Norma have long filled permanent slots of my personal battery. Those and the others I have worked with consistently shot inside half-minute-of-angle with their preferred loads. And the rounds fired in achieving that is often relatively small in number. Functioning was flawless. You have to actually shoot a Cooper to believe how smoothly cartridges glide from that single-stack magazine and into the chamber. Three locking lugs reduce bolt rotation to 60 degrees for increased unlock clearance between the bolt handle and a scope, but it requires a shorter and steeper firing pin spring compression cam surface. This is why lifting the bolt of a Cooper rifle takes a bit more effort than for a rifle with a two-lug bolt, although I have never found it to be problematic in the field. Bolt lift becomes easier through years of use, and applying a thin layer of Shooter’s Choice High-Tech Gun Grease to the cam surface of the bolt body after each shooting session further reduces the amount of effort required. Backcountry chambering options include the .270 Win., .30-06 and other popular long-action standards, as well as belted magnums up to .338 Win. Mag. I cannot think of a rifle I’d rather have with an extremely tall, steep and rugged mountain between me and a record-book sheep.